I’ll admit that I’m an impatient student who likes to learn on her own, so after buying a sewing machine, I decided to teach myself the basics. Well, re-teach is more like it. After all, didn’t we all have to learn to sew during home economics in junior high? After playing around with the machine a while, I felt confident that I could sew a straight line, so off to the fabric store I went with my 40% off coupon in hand and my 19-month-old daughter in tow. I planned on picking out some cute fabric for a no-sew blanket for the boys, a dress for my daughter and a skirt for me along with some craft projects for the family for spring break. My daughter had no intentions of tolerating that long of a shopping trip. 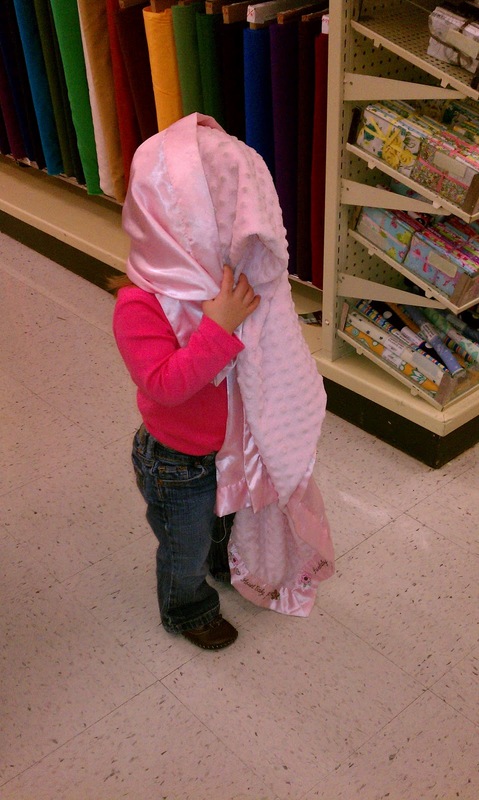 Instead, she insisted on bringing in one of her favorite blankets AND dragging it through the store. I just have no idea who she got her stubbornness from, but she was my muse that evening. I found some satin-like fabric in pink, of course, and some adorably soft fabric, also in pink, and I decided I would sew her some mini blankies. Who’d need a pattern for something like that? Memories of learning to sew a pillow came flooding back, so I knew I could handle this. Thankfully, all the boys were out of the house that night, either on vacation or at a sleepover, so once I tucked in my ever-so-stubborn yet even more adorable princess muse, I went to work. I found my middle son’s favorite mini blankie from when he was a toddler to use as a guide and decided to watch my how-to-sew DVD that came with my new machine while I laundered the new fabric. I had intended on making two, but one yard of fabric was enough to make three, so I can give one as a gift and will still have one as a spare for when we can’t find the original. The first one took over an hour to sew while the second one took about 20 minutes. If you would like to make a similar mini blankie, lovey, snuggly, or whatever cute name you have for these must-have miniature baby blankets, you can read my tutorial, but be kind. I made this up as I went, and I am a complete amateur sewer. Step 4: Get out your sewing machine and sew together fabric, creating a ½” seam (this is how I did it because I’m not proficient enough with my sewing skills to make 1/4” seems yet) on one side, using the reverse sewing lever reinforce your seams at the beginning. When you get ½ inch from the end of the first side, rotate your fabric 90 degrees, leaving the needle down but raising the presser foot up to turn and continue sewing the next side. Repeat until you get to the fourth side and stop when you have about 4 inches left and use the reverse sewing lever for reinforcement. Step 5: Carefully reach through the unstitched portion to pull the fabric so it’s no longer inside out. Step 6: With needle and thread, sew the remaining section closed by hand with a top stitch. I hope your child loves his or hers as much as my little princess loves her new one!